chapter 1 ----->what is a computer? Human body has many parts.Each part does some special function. Tongue to taste and so on. In the same way a computer too has different parts.Each part does some special work. Let us look at the parts of a computer. Monitor looks like a television set. If you type something on the keyboard,the word or sentence will appear on the screen. HUMAN think and remember with brain.Human brain tells the parts of body what to do. In the same way a computer too has brain ,which is called the CPU(stands for central processing unit). The CPU helps the computer to remeber things. KEYBOARD has many buttons called keys. We use the keyboard for typing. You can type any letter or number by pressing the key of that letter or number. Mouse points at things on the screen. You can also draw pictures using a mouse. 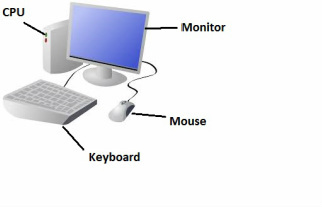 NOTE: The monitor,the keyboard and the mouse are connected to the cpu with wires. other parts of computer are printer,speaker,scanner and so on. Printer is used to print something on paper.